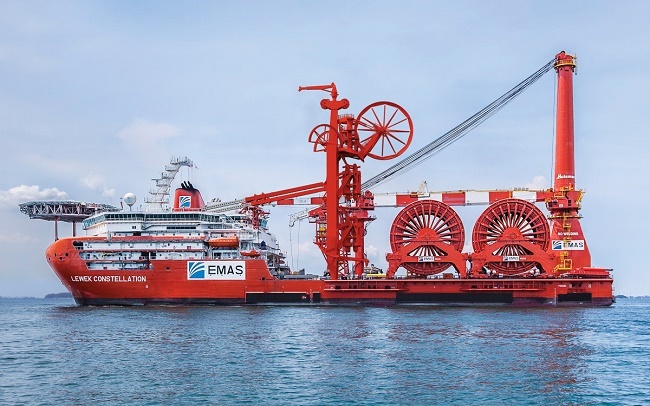 During sea trials in the Gulf of Mexico, the subsea construction vessel Lewek Constellation of EMAS AMC set an industry pipelay record. The 632 mT tension recorded was the highest tension ever experienced in the history of rigid reeled-lay operations. EMAS AMC is the subsea division of EMAS. It is the leading global offshore contractor and provider of integrated offshore solutions to the oil and gas (O&G) industry. The company announced that the achieved work result of its construction vessel, Lewek Constellation, is an industry record for pipelay in the U.S Gulf of Mexico (US GOM). The Lewek Constellation record was set in the Gulf of Mexico in 7,368 feet (2,246 metres) of water during her sea trials. The final pipe lay operations of Lewek Constellation in the Gulf of Mexico were part of the preparation for the execution of three subsea tie-back projects for Noble Energy in the Gulf of Mexico.